Have you ever seen the iconic National Park Posters from the 1930s and ’40s? They were beautiful serigraphed posters originally produced by the Works Progress Administration’s Federal Art Project to promote travel to National Parks. Few of the original prints remain, but the original screens were restored and artists are reproducing those images as posters, stickers, etc. which can be purchased today. 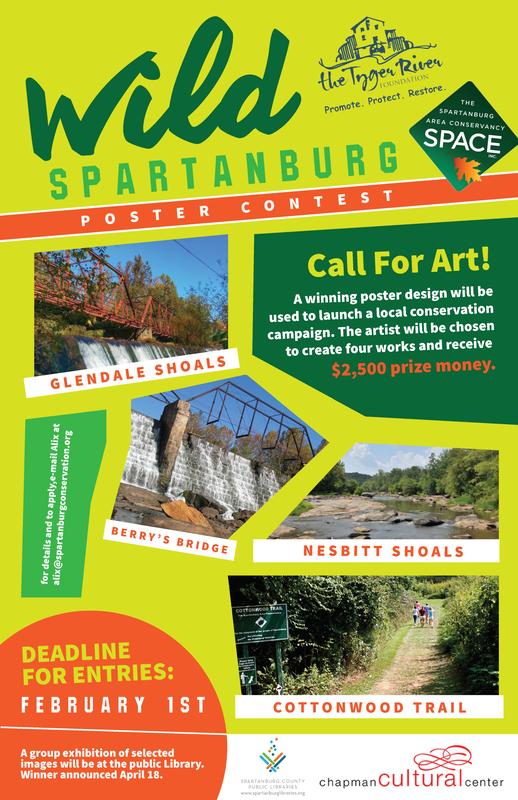 Through the WILD Spartanburg Poster Contest, you’ll be able to purchase posters and stickers of your very favorite Spartanburg nature preserves sometime in 2020! The deadline for entry is January 15, 2019, and posters will be displayed at the Headquarters of Spartanburg County Public Libraries from February-April 2019. Go to the Chapman Cultural Center website to learn more about the contest and see how much you could win! This process will require the lower level to remain in place until the end of February, providing our watershed management staff and adjacent property owners an opportunity to examine the shoreline and perform other routine maintenance. Although not required, we recommend that any boats be moved from the water during the drawdown. Our wardens can answer any specific questions regarding boats on the lake. A lot of different variables may cause lake level fluctuations during the drawdown period, the most significant being heavy rainfall. This may result in a longer time to reach our target drawdown level and, if wet weather patterns persist, may actually prevent us from reaching or sustaining these lower levels in Lake Bowen. The drawdown will slowly lower Lake Bowen’s and Lake Blalock’s standard, or “full pool,” heights by approximately two-and-a-half to three feet. For more information, visit Spartanburg Water's Website or call the Lake Bowen Wardens’ office at (864) 578-5442. Spartanburg Water's number-one priority continues to be the fulfillment of our mission to provide quality water in a reliable manner. Reliance on facts allows us to address this issue and get back to the business at hand: Ensuring the delivery of safe, quality water to more than 200,000 people. Spartanburg Water announced a new program that provides an opportunity to gain authorization for any existing improvements — including both permanent and semi-permanent structures around Lake Bowen — that currently exist on Spartanburg Water property below the 827’ Contour Line. The Pause Program started October 1, 2018, and continues through December 1, 2019. During this 14-month period, adjacent property owners may request to “Press Pause” and establish a baseline of permits for the improvements below the 827’ Spartanburg Water property line. Spartanburg Water staff will work with each property owner to review and establish a baseline of permits, licenses and/or agreements. All existing improvements, semi-permanent or permanent structures, as of October 1, 2018, in good condition, will receive an authorization from Spartanburg Water. Free Screening of "The Burden"
Join us and invite your friends and family to this free screening of The Burden, a film connecting the dots between clean energy and national security. This is part of the Conservation Voters of South Carolina's Defense Week (October 22-25, 2018), in partnership with Upstate Warrior Solution. Although the event is free, please RSVP to aid in preparation for the event. RSVP here. We are seeking volunteers to assist with set up and facilitation of this event. Volunteers get drinks and swag on us!